Posted July 25, 2014 by Heather Michet & filed under DIY, Drinking Water, Health Tips, Water. We all know that the sun and moon give off serious energy which affects our lives 24/7/365. You’ve felt the intensity of a full moon as well as the burn of the afternoon summer sun. Wouldn’t it be great to capture this energy and utilize its qualities? There’s an easy way to do this without standing beneath one of the orbs: turn drinking water into Full Moon Water or Solar Water. It’s a great way to capture and ‘save’ some of this energy for use now or later. Charging water can off-gas (but not disinfect!!!) chlorinated water when filtration isn’t available. 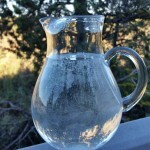 Fill clear, clean glass jars (the one gallon ones work great) with filtered water . For Full Moon and Solar Water, place lid on jar. If you wish to off-gas chlorine from water, cover with a double layer of cheesecloth to keep critters and debris out. Position jar on a flat surface, preferably bare ground, that will receive moonlight during its full phase for at least 2-3 hours. For Solar Water, position jar so that it will receive full sun from late morning to mid-afternoon. This is the period of time that the sun’s energy is most intense. After the extended exposure, bring jars inside. Label and date them to identify contents. Drink the water containing the quality you wish to boost in yourself. Example: it’s the dead of winter – dark, cold, somber. A nice dose of sunshine is a bit out of the question but you can reach for a glass of Solar Water (yang) and think back to that summer day when you captured the light, heat and energy in this water. This can also help boost enthusiasm or motivation to take the next step on a project or get your workout gear gathered and head to the gym! Full Moon Water (yin) may be useful for boosting self-esteem (the water’s packed with ‘full potential’), help promote dreaming and reflection, or get in touch with some emotions. Go round up your jars and capture some planetary energy! It is yours for the taking to help ground, center and balance your life. This is so amazing. Sounds enchanting and ethereal. I’m going to try this. Thanks Heather for sharing this beautiful post. You are welcome, Jane! Tonight’s the Wolf Full Moon – a very powerful one – so it’s a great night to charge up some water.